Autumn is officially upon us, and it's a great time of year to be a Pezhead. Particularly, the Halloween holiday brings together several essential elements of the Pez philosophy: candy, youth, fantasy, fun, and sharing. I have already filled my candy bowl with assorted flavors of Pez candy for all the trick-or-treaters out there, and as this month's feature article mentions, I might be doing some trick-or-treating myself as a Pez dispenser. I therefore dedicate this issue of Pezhead Monthly to Halloween. After all, the ghosts, witches, and pumpkins that are so often associated with this holiday are also Pez dispensers, and what kind of a Pezhead would I be to ignore that? I also think it's important to mention that it has been very hard to concentrate on the relatively light tone of the newsletter with so much shock, sorrow, worry, and anger in the air due to the September 11 tragedies. Nonetheless, as a popular song (almost) put it, The Pez Must Go On. I hope that you are doing well and keeping a positive and youthful outlook on life. Have a happy Halloween and I'll see you in November. 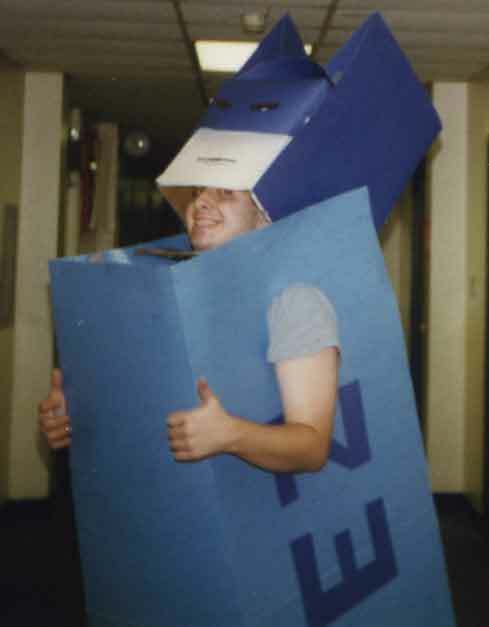 I can recall one Halloween in college when I dressed up as a Pez dispenser. Going from store to store in search of a Pez costume, but finding nothing, I began to get desperate. So I finally settled on using poster board for the Pez costume. I decided to be a Batman Pez, and so I took great pains to cut the poster board and to decorate it with the illustrious Pez logo and even the serial number. When the day came, I proudly put on my costume and headed to my classes with it (armed with a real Pez dispenser, to share the joy of course). Unfortunately, I did not count on the strong winds that day. I probably should have, considering that I went to school up by Niagara Falls. But the wind was so strong that I had to struggle to keep the flimsy poster board on my person.Towards the end of the day, the costume blew right off and started to roll across campus. As a Pezhead, I have always been in pursuit of Pez, but until that day I don't recall actually running to catch it. My creative yet ill-fated Pez dispenser costume. The moral of the story is that even though it is incredibly fun to be a Pez dispenser for Halloween, it is incredibly stupid to do so with poster board near Niagara Falls.